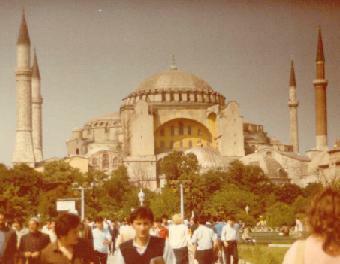 In June 1984, Rosalie took off for three days of shopping and eating in Istanbul Turkey. She stayed at the famous Hotel Perla Palas, whose other famous guests include Mata Hari, Greta Garbo, Zsa Zsa Gabor, and numerous Kings. She even ate in the historical Galata Tower built around 600 A.D. She brought home numerous memories and treasures. St. Sophia, the greatest Byzantine Basilica. Ancient Egyptian hieroglyphs adorn this monolith. 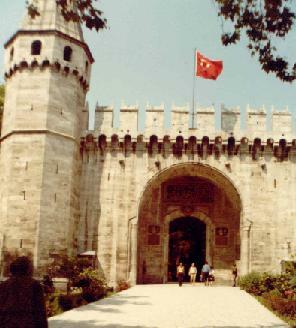 An ancient castle flying the Turkish flag. 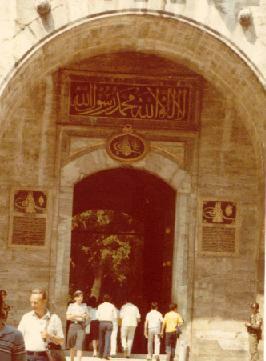 A closer look at the castle gate with the stylized Arabic writing over the door and an armed guard on the right.